Jarome Iginla is a Boston Bruin–at least that’s what you thought if you went to bed before midnight, much like I did. In a strange turn of events, he’s not. In case you haven’t already heard, the Penguins swooped in and acquired Iginla in a shocking last minute deal. Iginla chose to waive his no-trade clause for Sidney Crosby, Evgeni Malkin and a 13-game winning streak over a team that can’t hold a lead in the 3rd period. Iginla chose to be a supporting cast member rather than the go-to guy in a pivotal game. Iginla wants to win a Stanley Cup, after all. And you can’t blame him. You shouldn’t, really. You shouldn’t blame the Bruins or Peter Chiarelli either, who had a deal on the table and an assumed press conference scheduled for this morning. It was a done deal, they said. They were wrong. Everybody was wrong. Everyone in the hockey world was surprised to hear that Iginla will don a different shade of black and gold on Thursday. In all of my life as a hockey fan, this is just straight-up bizarre. In a sense, however, it’s almost poetic that what would have been one of the biggest acquisitions in Bruins’ recent history never came to fruition. They’re not that type of team. They never have been the kind of hockey organization that would pursue the biggest name available at the trade deadline and actually come close, seriously close, to landing him. That’s not necessarily a knock on the Bruins, but rather, a sort of juxtaposition of how the team was built in the past. The Bruins aren’t the hockey-equivalent of the New York Yankees, adding superstars who yearn for a championship in return. But this was supposed to be different. 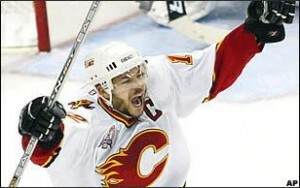 This was Jarome Iginla. This was the missing piece to another Cup for the team. This entire season seemed to be focused around the eventual fate of Iginla. It was assumed that the now-former Calgary Flames captain would waive his NTC and in recent days, it seemed that the Bruins were front-runners. Did the recent play of the Bruins actually cause Iginla to choose the Penguins? No, and it’s pretty stupid to think that. Iginla chose the Penguins because they have more of a chance to win a Stanley Cup with Crosby, Malkin, James Neal, Brendan Morrow and the rest of the all-star team. It’s that simple. The blown lead/Bruins’ recent struggles narratives are lazy thinking and really has nothing to do with it. So what do the Bruins do now? I’m not so sure, but whatever it is, it won’t be good enough, unfortunately. That’s not to say the Bruins don’t stray away from their gameplan and go out to acquire a premier top-six forward, but it’ll be an overpayment. Chiarelli could try to overcompensate for the botched, incredibly reasonable, Iginla trade and go overboard for another player by trading away prospects who shouldn’t have ever been considered to be moved in the first place. If the Bruins go low-key with any trade deadline additions, they’ll never be good enough for everyone. They won’t be Jarome Iginla. The Bruins found themselves in a terribly awkward public relations mess with less than a week away from the trade deadline. It will no doubt be a long Thursday and a longer stretch before the Bruins’ next game on Saturday against the Philadelphia Flyers. Everyone will be talking about Iginla, the (assumed) 2013 Stanley Cup Champion Penguins and how the Bruins missed out big time. It’s easy to be deflated and let down if you’re a Bruins fan. Maybe everyone puts too much faith in hockey insiders on Twitter and sports radio and not enough in the product on the ice. This Bruins team can still compete as is, but a Cup run goes through Pittsburgh. Until the Bruins figure out a way match their ability, or you know–just play better, that’s that. Maybe this makes the Bruins angrier, hungrier. Maybe not getting the guy Brad Marchand called “an idol” after the overtime loss on Wednesday against Montreal will make the Bruins want it more. Maybe, this entire time, they’ve been skating under the stigma that Jarome Iginla will come and save the day. Maybe they just have to get their heads out of their asses and play better. That might be it, too. So, who’s the next target for the Bruins? Your guess is as good as mine. Follow Mike on Twitter for more Bruins updates, news and commentary.